Dwayne Johnson, better known as “The Rock”, is an actor, former college football player and former WWE wrestler. He’s made a career through his strength and muscular body. He first became known as “The Rock” when he was a WWF in 1996, and it stuck with him ever since. After he left wrestling he became involved in movies, and is now seen in major motion pictures every year. Because Dwayne is so well known for his body, he is followed by a lot of people who want to achieve the same results. He weighs around 260 pounds and has large muscles that are easy to see in and out of clothing! He even does some modeling, and has appeared on the covers of many different magazines. 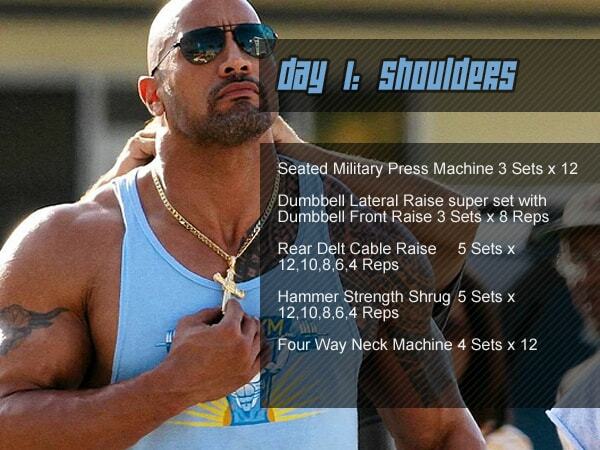 Dwayne focuses on building muscle so that he can keep his body fat as low as possible. This means he puts in a lot of work at the gym doing weight lifting around three days per week. He also has one day where he lets his body rest, which means not participating in weight lifting. As for the other three days, he spends those doing cardio so he can burn calories and keep his weight down. The workout for “The Rock” is different each day of the week so the he exercises each part of the body without overworking each area. 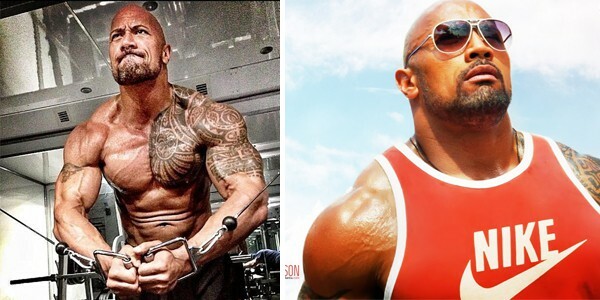 Since Dwayne has a lot of acting and modeling jobs, he stays in good condition all throughout the year. Working out is a passion, and it should be for anyone who wants to have a body like his. The number of reps he does may be different from what you can do at first, but with time you should be able to do more. He also makes sure he warms up before working out and cools down afterward as well, which protects his body from injury. The diet that Dwayne Johnson enjoys on a regular basis is simple and clean. He focuses in a lot of protein to help build his muscle, but he also eats complex carbohydrates that give him energy. He eats an average of seven small meals per day, but sometimes it might be more than that. Each of the meals he eats are nutritionally balanced with complex carbohydrates (i.e., rice or potatoes), protein (i.e., fish or chicken) and some type of vegetable, like broccoli or spinach. If you go on the diet that he does, then don’t expect to eat any junk or processed foods. Dwayne believes that his diet should be clean and nutritional so that his body thrives from it. In addition to eating whole foods, when you eat like Dwayne you’ll find that supplements are necessary as well. For example, omega-3 fish oils are recommended and he takes them regularly. 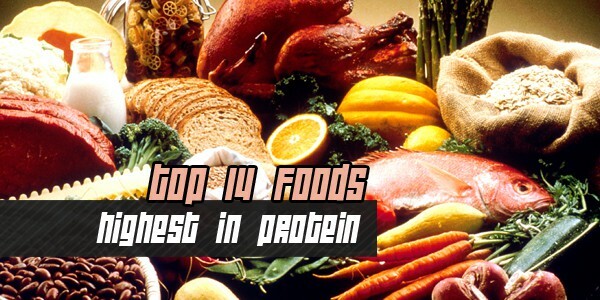 Casein protein is also going to become a part of your diet if you want to get in more protein without having to eat a ton of meat or fish all day long. He’s gotten his body through natural food and hard work, and you can too if you’re dedicated. All! Exercise releases edeinphorns into your body which actually put you in a better mood. Exercise helps your body make better use of using fat as energy. And finally, doing more or better than you did last time will help you build self esteem. Martial arts and dancing, as you mentioned, may be even better in building self esteem because you’ll actually be learning a new skill that the majority of the population does not know.The most important thing is to find something you enjoy and then put your all into it every single time. Don’t focus on anything else when you do it and try to better yourself every single time.